Make a paste of all the ingredients mentioned under garlic paste. You can also skip blending and mix up red chili powder, minced garlic and rest of the ingredients with water as needed. Set aside. Heat a pan with oil. When the oil is hot enough, Add mace or cumin. Wait for 30 seconds, add onions and saute until golden. Add in the garlic sauce and saute for 2 to 3 mins without burning. Make sure the raw smell of garlic has gone and the mixture turns aromatic. 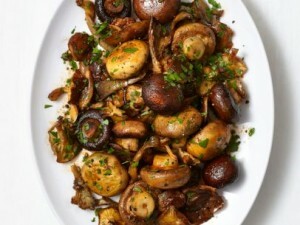 Add mushrooms and saute for 2 to 3 mins. Cover and cook on a medium to low heat until the mushrooms are cooked completely.